The story of the fallen woman was a staple of film melodrama in the late 1920s and 1930s. In traditional plots, a woman commits a sexual transgression, usually adultery. She becomes an outcast, often a prostitute, suffering humiliations that culminate in her death. In more modern variants, the heroine is a stereotypical "kept woman," "gold digger," or wisecracking shopgirl who uses men to become rich. 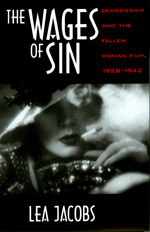 In The Wages of Sin, Lea Jacobs uses the fallen woman film, which served as a focal point for public criticism of the film industry, to explore Hollywood's system of self-censorship and the evolution of the rules governing representations of sexuality. Drawing on the extensive case files of the Motion Picture Producers and Distributors of America (MPPDA), the industry trade association responsible for censorship, Jacobs focuses on six films. Her close analyses of The Easiest Way, Baby Face, Blonde Venus, Anna Karenina, Kitty Foyle, and Stella Dallas reveal the ideology of self-regulation at work and the social constraints affecting the film industry. Lea Jacobs is Associate Professor of Film at the University of Wisconsin-Madison.